Maersk Oil has announced that the Danish Underground Consortium (DUC) has approved an investment of approximately DKK 21 billion in the full redevelopment of the Tyra gas field. The announcement follows the Danish Parliament’s approval to implement legislation to secure the investment. The redevelopment of Tyra ensures continued production from Denmark’s largest gas field, and will protect and rejuvenate important Danish North Sea infrastructure. This announcement represents the largest oil and gas project investment ever made in the Danish North Sea, enabling Tyra to continue operations for at least 25 years. At peak production, the redeveloped Tyra gas field will provide enough gas to supply 1.5 million Danish homes, supporting energy security, future tax revenues and employment for Denmark. The investment cost for the modification to existing facilities and construction of new facilities (CAPEX) is estimated at approx. 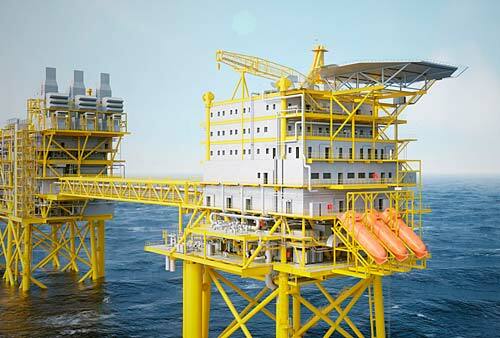 17bn DKK, and the cost in relation to removal and decommissioning of current facilities (ABEX) is estimated at approx. 4bn DKK. Tyra is the centre of Denmark’s national energy infrastructure, processing 90% of the nation’s gas production. Through new development projects and third party tie-ins, the redevelopment of Tyra can be a catalyst for extending the life of the Danish North Sea – not just for Maersk Oil and the DUC, but also for Denmark. The new infrastructure can enable operators to pursue new gas projects in the northern part of the North Sea, where the most recent development, Tyra Southeast, delivered first gas in 2015 and is producing above expectations. The redeveloped Tyra is expected to deliver approximately 60,000 barrels of oil equivalent per day at peak, and it is estimated that the redevelopment can enable the production of more than 200 million barrels of oil equivalent. Approximately 2/3 of the production is expected to be gas and 1/3 to be oil. Alongside the Maersk Oil-operated Culzean development in the UK North Sea, the Tyra gas field redevelopment increases Maersk Oil’s exposure to natural gas production; an important bridging fuel for the energy transition. The redevelopment of Tyra is enabled by the legislation implemented by the Danish Parliament 28 and 30 November 2017. The Tyra field will be shut-in for the redevelopment in November 2019, and production is expected to recommence in July 2022.